Variety was heavily censored for its American release. In the censored version, the story is a classic love triangle of husband (Emil Jannings), wife (Lya De Putti), and wife’s lover. In its original version, Variety began with a lengthy section showing how Jannings fell in love with De Putti, left his wife for her, and then created the trapeze act with his lover. 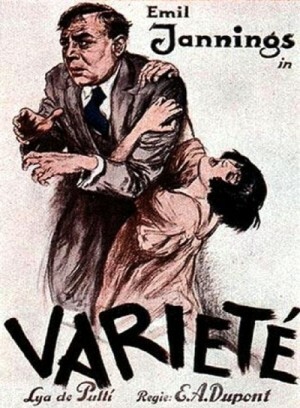 This part of the story was excised completely by the American censors and title cards added to redefine Jannings and De Putti as the married couple of the U.S. release version. The censors’ intent was plainly to erase the objectionable plot point that cast adulterous lovers as the established couple of the love triangle. They succeeded in radically transforming the story. The unfaithful husband who is in his turn betrayed by his unfaithful lover is transformed by the censors’ scissors into a sympathetic cuckold. I wrote to the support. I hope that they will respond quickly. Hi, it's working fine, now. Thanks so much!